If society can be distilled or simplified down to its ingredient cultures, and if cultures come from and are based on traditions, then a society’s art based on component cultures and their respective traditions means, by extension, that all art is folk art. 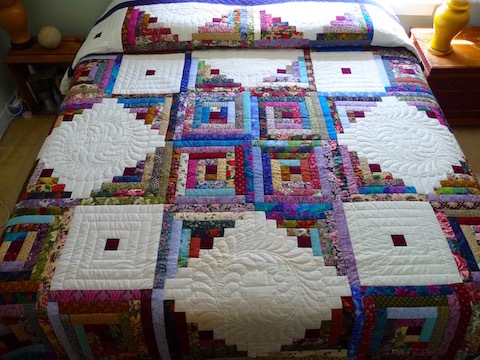 Handmade quilts are art and as such, the folk art of the Amish. They symbolically present beliefs, whisperings, conventions, habits, lifestyles and memories of a culture that began in Europe in the late 1600’s. However, even back then the culture and its traditions were based on conventions that arose from previous times. So it goes back and back, reflecting what came before until the echoes eventually fade. 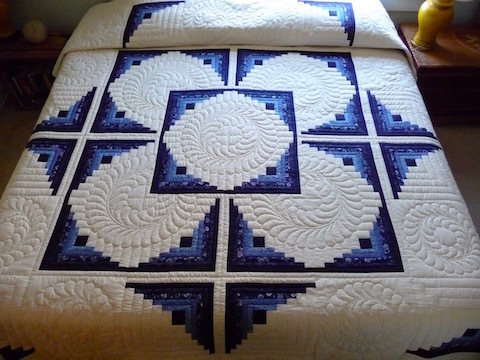 A handmade Amish quilt should be seen as patterns and colors that may not have originated with the Amish. However, the Amish make pattern and color their own, filtered through their beliefs and lifestyle. What is particularly fascinating is how some Amish quilts reflect not back but forward to the future! (We’ll discuss this in an upcoming post.) 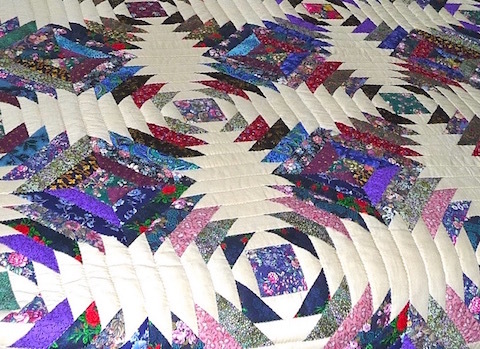 We’ve written 8 articles that discuss, from a folk art point of view, the basic types, designs, patterns and colors used by the Amish in their quilt making. Basic Log Cabin quilt blocks are hand-pieced strips of fabric around a central square. One half of the strips are usually dark and the other half light. During America’s Civil War, the term “Log Cabin” was coined and may have had a connection to the presidency of Abraham Lincoln. However, similar Log Cabin-like designs are found in English quilts predating 1830. An interesting historical point pertains to folklore suggesting that the signals for stops along the Underground Railroad were indicated by Log Cabin quilts hanging on clotheslines, with the color of the central square indicating special instructions. Specific to Amish culture, a red center square symbolizes the hearth of home and a yellow center square indicates a welcoming light in the window. The most interesting aspect of the Log Cabin quilt pattern is its capacity for manipulation into different patterns. The simple strips around a center block can be varied in size to create the curves seen in a Log Cabin in the Round quilt. 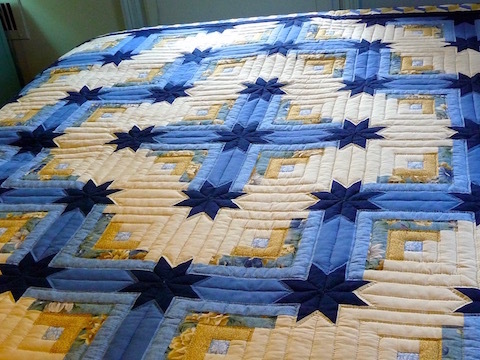 A quilter can also make diagonal cuts into the “log” strips, sew them back together and create stars as seen in the Colorado Log Cabin quilt. Other variations include the Star Log Cabin and the Pineapple Log Cabin.